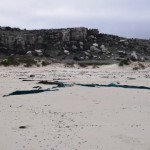 Some time ago I promised to describe the route we took in the Cape Point Nature Reserve to locate the wreck of the Phyllisia, a small fishing trawler wrecked in 1968 and one of the visible shipwrecks around the Cape Peninsula. Here’s that post! 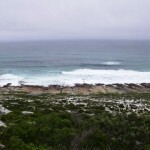 Tami, Maria and I set out on a slightly drizzly, grey morning from the Gifkommetjie parking area inside the reserve. 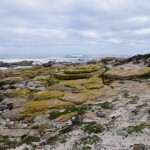 The first part of the walk was a steep descent down to the beach at Gifkommetjie, where we admired some fishing debris. 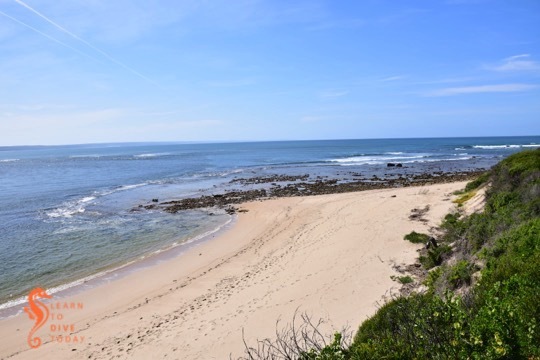 From there, the trail meanders north, parallel to the coast. 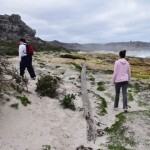 Most of the path is sandy, but other parts are rocky and hard-packed. 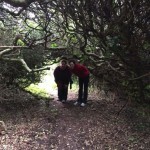 There are natural tunnels formed by the overgrowing milkwood trees, requiring a bit of ducking and crouching to go through. 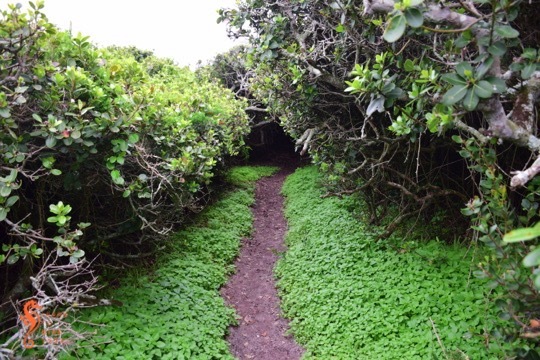 The feeling of being in a forest and yet right by the ocean is lovely. 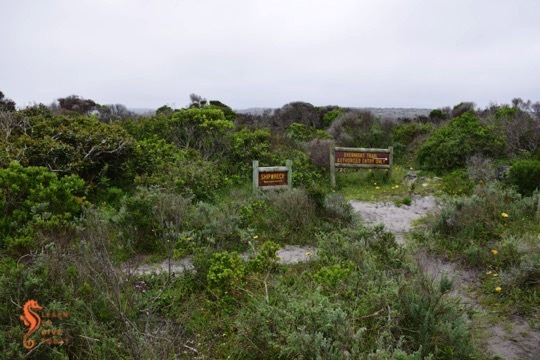 After about 2.5 kilometres – the path gradually bends inland – one reaches a T-junction, with an unambiguous sign saying SHIPWRECK, pointing left. 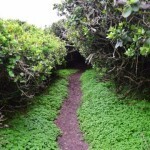 If you want to see the Phyllisia, or just get closer to the coast, take that path! 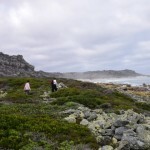 It’s another few hundred metres across unclear paths over the dunes to Hoek van Bobbejaan, a promontory with a beach to the north of it (pictured below) that really shows the wildness of this stretch of coast, and how exposed it is to the open ocean. 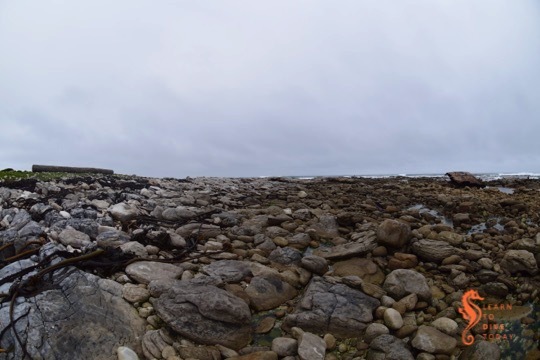 The Phyllisia is right on the outermost point of Hoek van Bobbejaan, and is the same colour as the rocks it’s lying on, so you might need to look carefully! 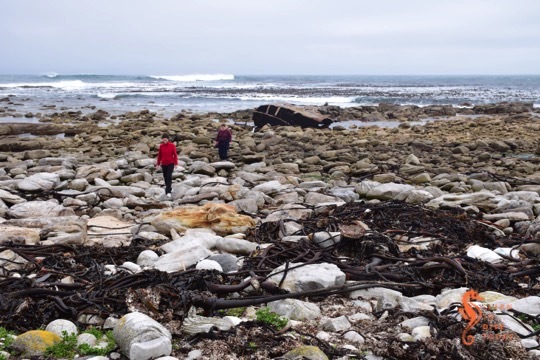 Just above the wreck is one of the (I think) large okoume logs that fell off a ship in Table Bay in 2008 – more on that in this post about the Shipwreck Trail. 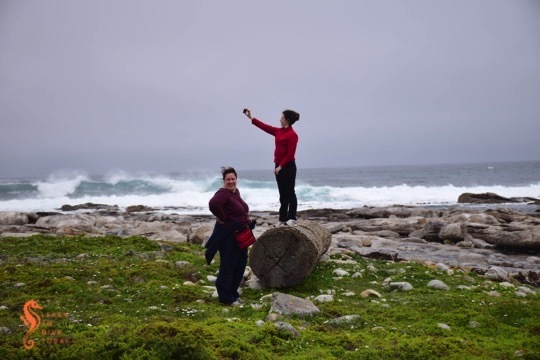 It’s a great spot to take stock of your surroundings, and a vantage point for photos, as Maria demonstrates below! To return, follow the path back towards the T junction and keep going straight. 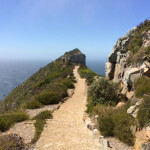 The path forks again – the left fork will take you towards Brightwater, and is part of the overnight Cape Point trail. 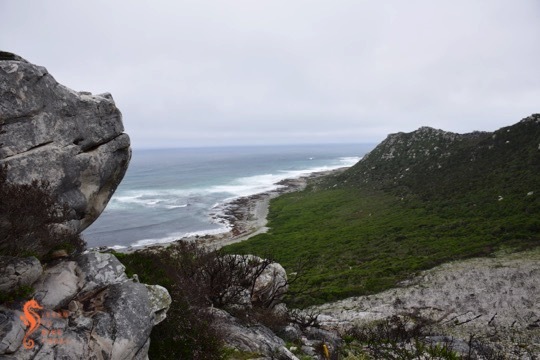 Take the right fork – you should start climbing the rocky ridge that you’ve been walking alongside, towards the level of the parking area. 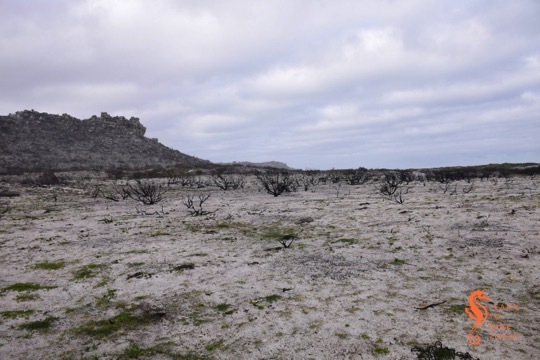 The return route is along the top of the ridge, along paths that we sometimes struggled to find because the vegetation had been burned away. Upright sticks with red and yellow paint on the end provided some guidance at intervals. 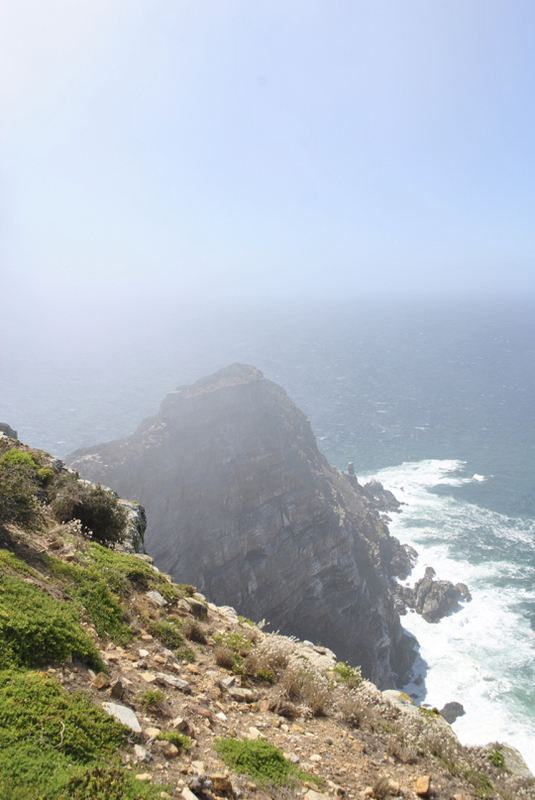 The views down over the path you’ve just walked, and back towards Hoek van Bobbejaan, are spectacular. 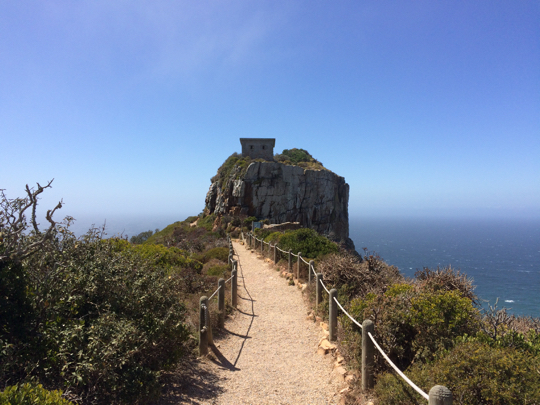 You can of course, also return the way you came, and do a short, sharp climb at the end back to the parking area, or do the entire walk back and forth along the ridge, skipping the milkwood tunnels, and descend to the shipwreck half way through the route. 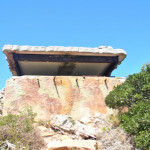 We saw bontebok, ostrich, baboons, an angulate tortoise, and wonderful spring flowers in the dunes and on the mountain. The walk took us about three hours at a slow pace, with a regular photo stops. 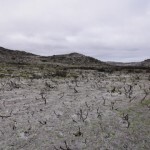 As always, if you go hiking, go in a group (four really is ideal), wear appropriate shoes and a hat, apply sunscreen take waterproof or windproof clothing even if the weather looks nice, bring water to drink, stay on the path, and tell someone where you’re going and when to expect you back. 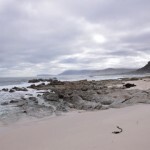 The mouth of the Breede River is a fascinating and beautiful location. 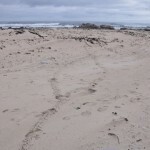 There’s a treacherous sandbar (more on that just now). There are wide, natural vistas. There are sleepy holiday villages on each side of the river mouth. 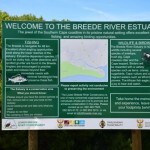 There’s an additional little frisson of excitement related to the fact that bull sharks use the Breede River, and must be passing by all the time (right?!). 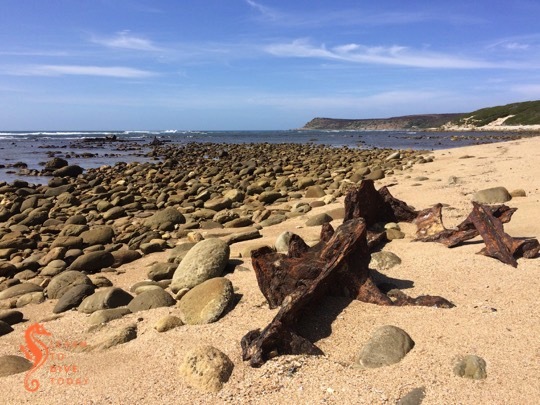 On 17 December 1865 the Kadie ran aground and sank while attempting to cross the sandbar at the mouth of the Breede River. 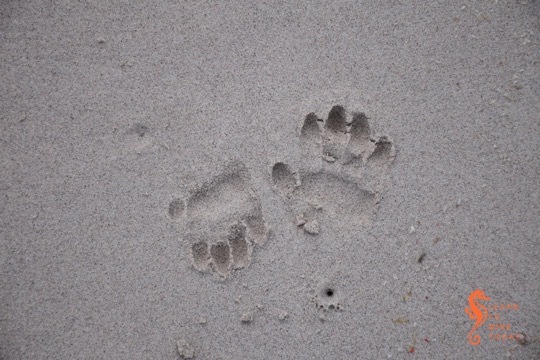 She is easy to find, but you should visit at low tide. 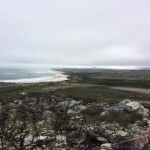 Take the turnoff to the river mouth from the dirt road to Infanta. It’s a small sign and easy to miss! 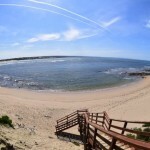 Descend the wooden staircase onto the beach, and walk right. 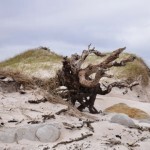 You will soon see pieces of the Kadie on the beach, in the shallow rockpools, and out in the surf zone. 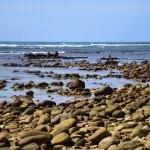 Best to go at low tide, or at least not at the peak of high tide. The Japanese crew of the MFV Meisho Maru No. 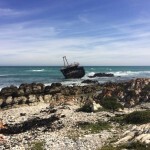 38 could not have picked a more beautiful piece of South African coastline to run aground on. 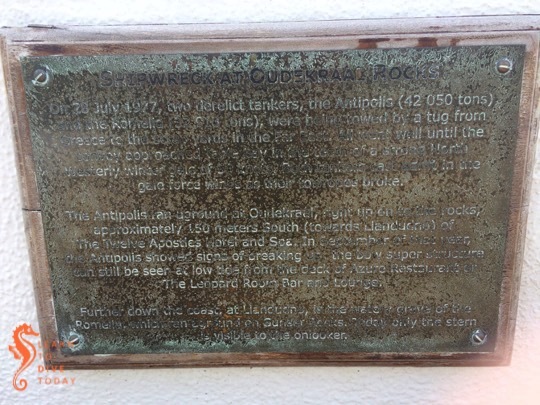 Granted, it was 3am on 16 November 1982 when they got into difficulties, and sightseeing was probably not high on their priority list, but the fact remains that the wreck is in a remarkably scenic spot. 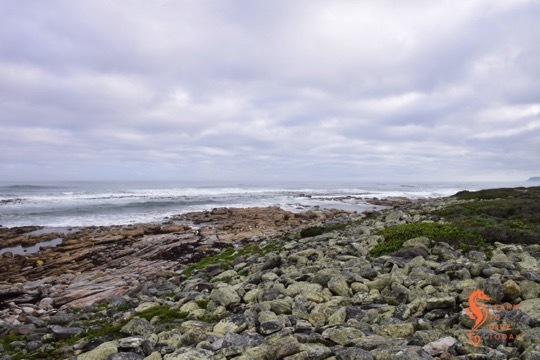 It is also within spitting distance (OK, two kilometres) of the lighthouse at Cape Agulhas. It is also very easy to access. 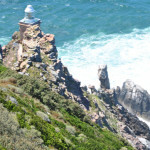 By foot, it is a flat walk along the coast for 1.5 kilometres from the signage at the southernmost tip of Africa. 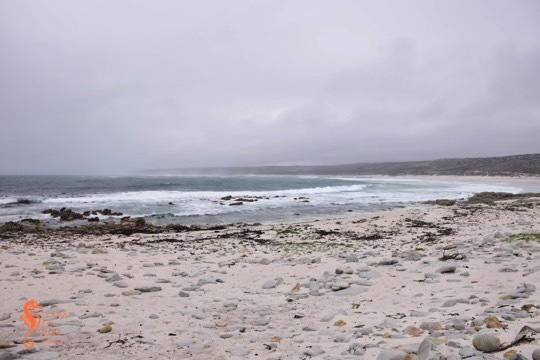 There is a well-kept dirt road out of L’Agulhas, which terminates at Suiderstrand, that runs parallel to the coast. If you drive along the road rather than walk next to it, you will see the wreck in short order. 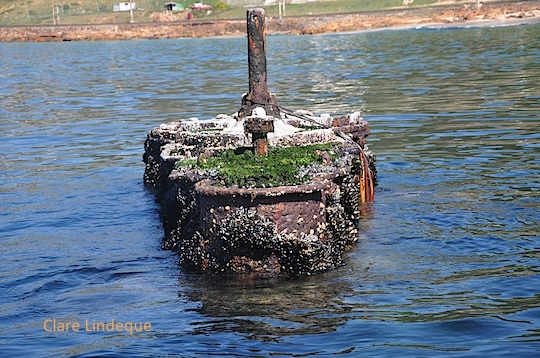 Here’s a picture of what the wreck looked like not long after grounding in 1982. 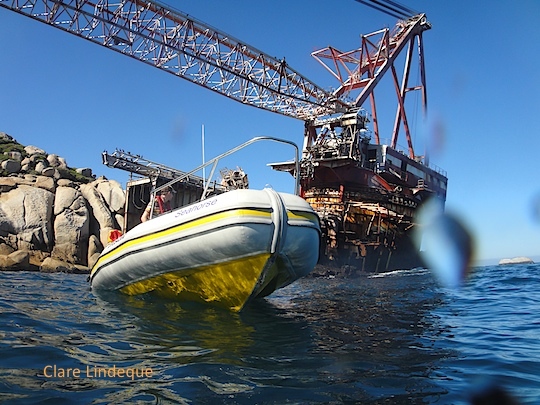 (Compare it to these pictures of the Eihatsu Maru, aground at Clifton…) She was about 45 metres long, and was carrying a catch of tuna. 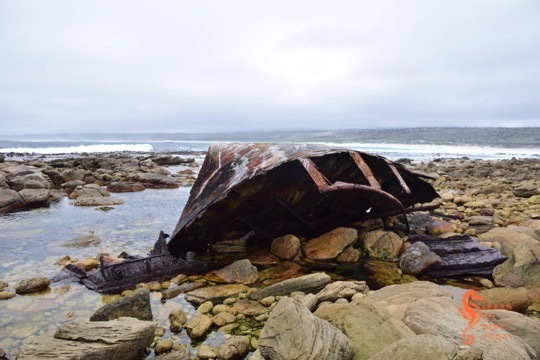 Her entire crew (17 men) managed to get ashore All that remains now is the bow of the ship, facing out to sea after being turned around by the waves. When we arrived, some Egyptian geese were sitting pensively on the railings. 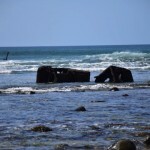 The rest of the wreck has broken up and is hidden in the surf zone. 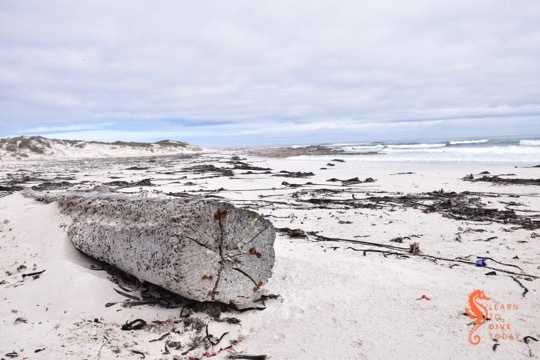 Decimal-form co-ordinates for the wreck are -34.829763, 19.983845, but if you drive from L’Agulhas towards Suiderstrand along the dirt road, you can’t miss it. 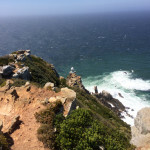 Newsletter: Where have all the weekends gone? 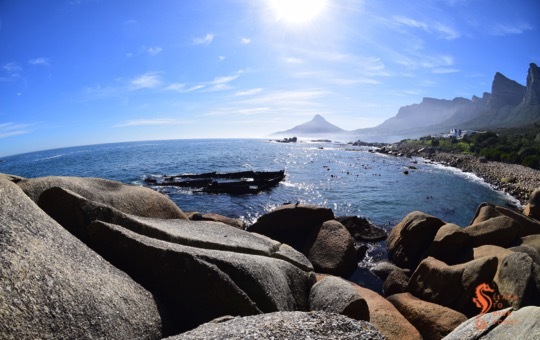 Weekend diving has become a scarce commodity of late and the best diving days have fallen in the week. 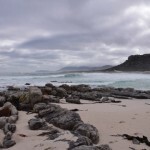 This weekend looks a lot better than last weekend: there is very little swell and no howling winds to deal with. 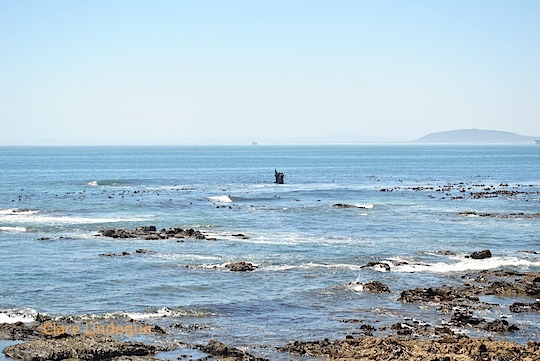 False Bay needs some westerly wind to clean it up, so I am going to choose Sunday as the better option for this weekend’s diving. 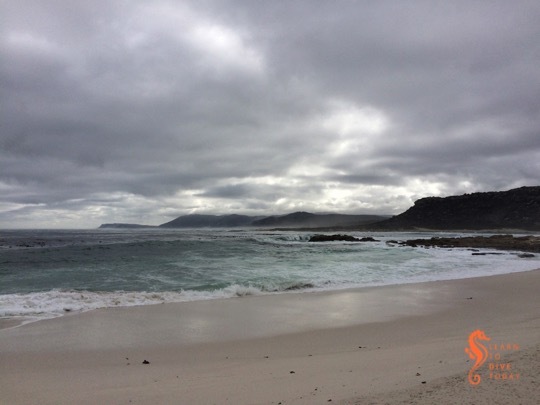 It’s windier than Saturday but less likely to rain, plus False Bay will have had a bit more time to improve. 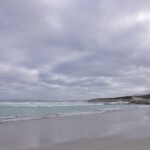 The Atlantic was crystal clear yesterday but I have my doubts it is going to stay that way for the weekend with the hot day we have just had. 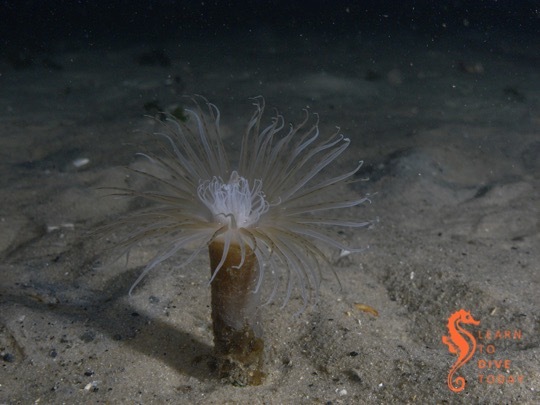 We are night diving on Saturday evening as part of the international Diversnight event, and will meet at Long Beach at around 7.15 pm. 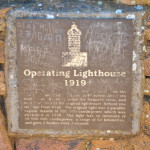 The idea is to be in the water at 15 minutes past 8.00 pm (2015). Text me if you are joining, make sure you bring your permit to dive in an MPA, and if you need to rent kit or a cylinder, I need to know by tomorrow (Friday) evening please. 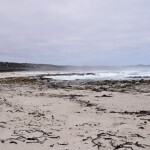 Be sure your permit to dive in an MPA is up to date. 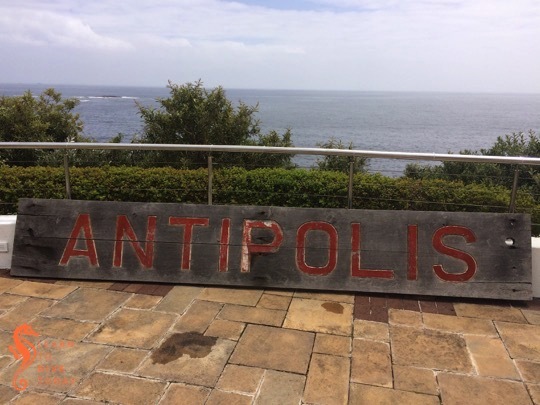 It’s particularly important that you bring it on Saturday evening if you plan to dive, so don’t wait until lunchtime on Saturday to look for it! 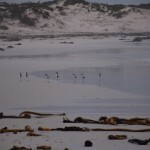 Diarise the Shark Spotters fundraiser on Sunday 22 November – should be fun. 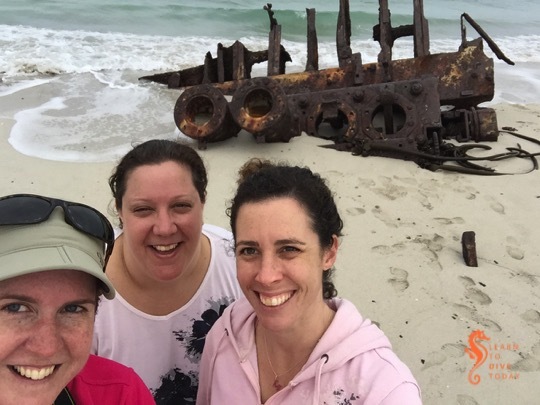 Clare wrote a small travel guide with information on the visible shipwrecks around Cape Town. Check it out here. 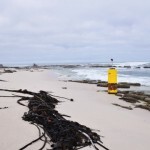 Posted on 6 November 2015 5 November 2015 Author TonyCategories Boat diving, Cylinders, Newsletter, Night diving, Shark Spotters, Swell, Visibility, WindTags visible shipwrecksLeave a comment on Newsletter: Where have all the weekends gone? 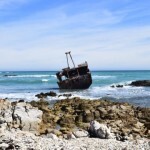 If you’re planning a trip to Cape Town and have a love of shipwrecks on shore, you’re in luck. 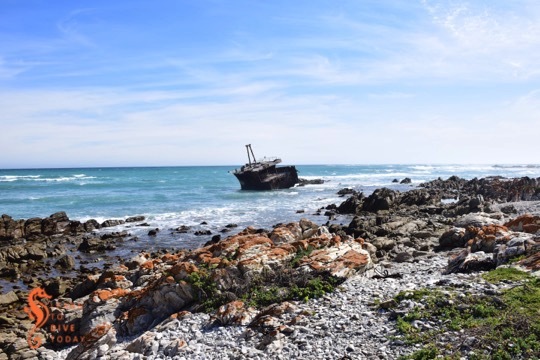 Visiting some of the wrecks that are visible above the water around the Cape Peninsula can be combined with your exploration of the city, and will ensure that you don’t miss any of its outdoor highlights. 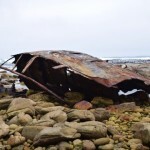 Some of these visible shipwrecks can be reached by road, and one or two of them will require a short boat ride. A map showing all these wrecks can be found here. 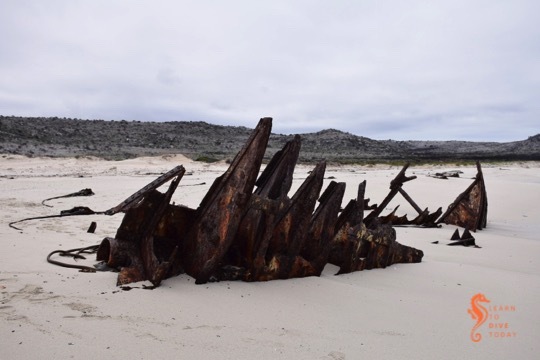 A mini travel guide to Cape Town’s shipwrecks on shore, in the form of an ebook entitled Cape Town’s Visible Shipwrecks and written by yours truly, is available here. 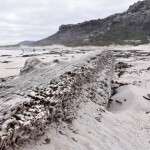 The Phyllisia was a Cape Town fishing trawler of 452 tons. 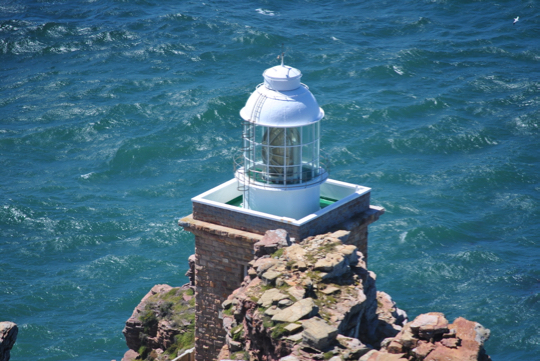 She struck submerged rocks a short distance offshore, close to midnight in early May 1968. 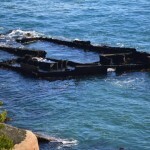 Holed in four places, she was partly submerged but remained intact for some time. 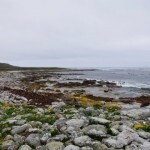 Eleven of her crew came ashore in life rafts, and the remaining 14 were airlifted off by helicopter. 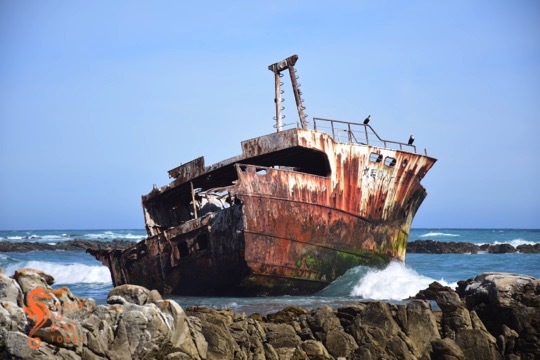 Initial plans to salvage the wreck were scuppered by continued heavy weather, and after the removal of the moveable equipment from the ship, she and her cargo of 30 tons of fish were left to the elements. 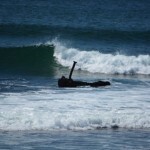 All that remains of the wreck on the shore is part of her stern. 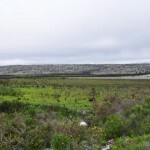 The walk to the Phyllisia from the Gifkommetjie parking area is about 2.5 kilometres, and I will describe the route in more detail in a separate post about the Phyllisia Circuit. 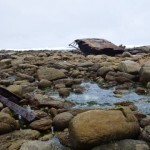 She is best visited at low tide, so that what remains of her stern is fully exposed on the rocky shore. 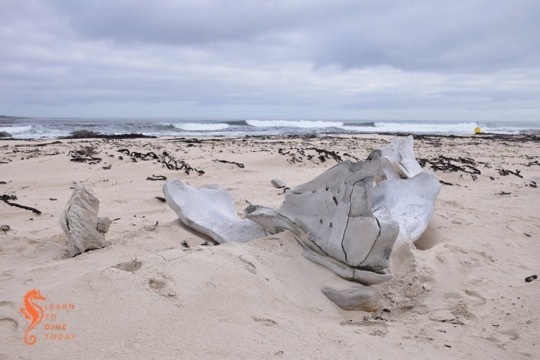 Look out for the various smaller bits of metal in the area, and also for the massive log that probably has the same origin as the one at Olifantsbos. 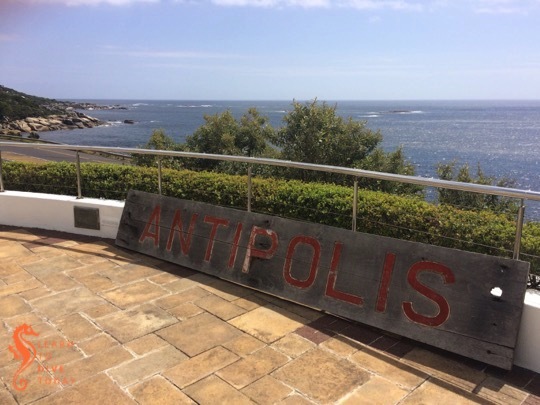 The oil tanker Antipolis ran aground off Oudekraal during a July storm in 1977. 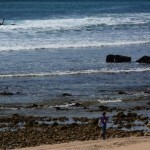 She and the Romelia, which is wrecked near Sandy Bay, were both under tow by the tug Kiyo Maru No. 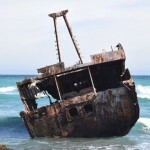 2 from Greece to be scrapped in Taiwan. 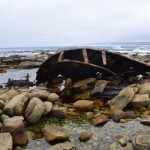 The wreck lies pointing shoreward, a couple of hundred metres south of the 12 Apostles Hotel. She can be viewed from a vantage point above a storm water drain between the hotel entrance and a small parking area on the opposite (seaward) side of the road. Walk along the Armco barrier from the parking area, looking to your left (while also looking out for cyclists). 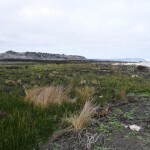 The storm water pipe is about twenty metres from the parking area and is marked by a gap in the bushes through which the wreck can be seen. 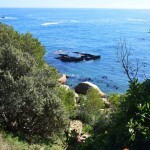 There is also the option of climbing down an impossibly steep and slippery path onto the rocks adjacent to the wreck. 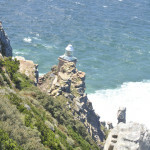 The view from here is slightly better, but it is not a climb for the faint hearted. 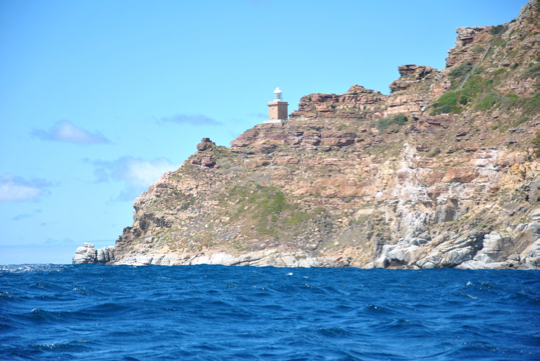 She is now a beautiful dive site if you visit in clear, calm conditions. 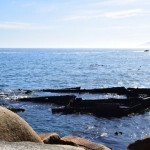 Most divers shore dive off the rocky beach in front of the wreck, after climbing over the traffic barrier and walking over the boulders on the shore. There are some pictures of the tanker just after she grounded here and here (the comments are also worth reading). Her superstructure was cut off some time later for scrap. The entire shape of the wreck can be discerned on aerial images, as much of her lies just below the waterline.